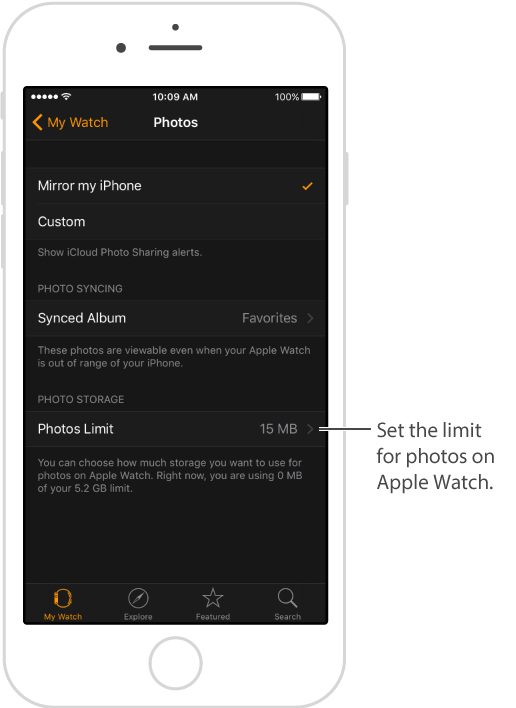 To save space on Apple Watch for songs or other content, you can limit the number of photos stored on Apple Watch. Limit photo storage. Open the Apple Watch app on iPhone, tap My Watch, then go to Photos > Photos Limit. Look below Photos Limit to see how much Apple Watch storage is currently used by photos. How many photos? To see how many photos are on Apple Watch, open Settings on Apple Watch, then go to General > About. Or, open the Apple Watch app on iPhone, tap My Watch, then go to General > About.